SimBionics: What is it good for? In the aftermath of Osama Bin Laden's slaying and the barely concealed triumphalism displayed by our American cousins the only surprise was that the severed head of the tyrannical despot wasn't paraded around Times Square. Scenes of jubilation and reverie as a nation rejoiced were par for the course as after almost ten years the U.S gained revenge for one of it's darkest days. It was the ultimate trophy killing and brought a sense of closure for all those directly affected by the assault on the Twin Towers. But as evil as the supposed leader of Al-Qaeda was the sight of thousands of people outwardly celebrating the expiration of another human being was somewhat unsettling and from an objective point of view bordering on sickening. There is no doubt that Bin Laden will take his rightful place somewhere near the top when the list of the world's most nefarious people is compiled sometime in the distant future. We will never know for sure just how instrumental he was in the 9/11 attacks but history will depict him as the main perpetrator and compare his repugnant feats to other deranged types like Hitler, Pol Pot and Saddam Hussein. The thing all of these oppressors had in common was their lack of respect for human life, killing someone meant as much to them as the absent minded swatting of a fly does to your average person. Sadly rather than be shocked and appalled by the deeds of the aforementioned it seems that as time progresses we are gradually lowering ourselves to their level whether we realise it or not. For as long as man has existed he has chosen to resolve the majority of his conflicts through force, deadly or otherwise. Quibbles over land, money, women, honour and of course national pride have entered the annals of history and with them the names of the great men who fought in them. We look back at skirmishes between the Greeks and the Persians, the French and the English and the Americans and themselves in awe and encourage our children to do likewise as we teach them of the daring feats of Nelson, Custer and the indomitable Spartans. That countless people died horrible, unnecessary deaths is overlooked as the cause and end result somehow justify the means. How many times have phrases along the lines of 'If it wasn't for us you'd all be speaking German' been heard spewing out of the mouth of an indignant patriot? So what if we had been speaking German? What if Hitler had 'won' the war? There would have been more wars, more deaths and more unwitting heroes regardless of the outcome of that or any other war. As long as warfare is our only means of resolving conflict then humanity will continue to create 'monsters'. Not only that but previously unaffected souls will return from the field mere shadows of the people that went out there. The turn of the twentieth century is considered a high point for mankind as technology, science and inventions progressed at a rate previously unseen. Up until this point wars had been raged on a mass scale over land and sea but although the casualties had been high the sense of devastation felt was nothing compared to what lay ahead. World War 1 saw the death of 9 million people over a four year period. Pause and consider that figure for just one moment. Then think of all those affected by the deaths, the mothers who lost their sons, the wives their husbands and the children their fathers. Those who survived this most hellish of experiences recounted tales so horrific as to be beyond comprehension to those not involved. And yet who amongst can say with any authority exactly what World War I was fought for. We may have vague notions about the allies repelling the dastardly German forces but in truth only those with a vested interest could attempt to justify and explain why young men barely in their teens perished in the mud of the Somme. WW1 is sometimes referred to as the Great War, presumably by those who sat in their ivory towers and relayed orders safe in the knowledge that no harm would ever come to them. Great were the losses and great was the grief but for those who sit in silent vigil at the various monuments of the Somme knowing that the remains of their ancestors were never recovered from deep in that muddy battlefield the idea of a Great War seems laughable. At this point in time it was still deemed acceptable to forsake your life for your nation's pride. Grieving loved ones were somewhat consoled by a piece of metal and the assertion that 'he died fighting for his country'. There was bad people on this earth and every now and then a war was needed to address the balance and rid us of those that wished to harm our children. No one questioned this on either side of the divide and the trust in our leaders was absolute. Those that thought there may have been another way to resolve the issue and avoid the deaths of an entire generation kept their mouths shut for fear of reprisal. Of course worse was to follow for those still scarred by what they'd just lived through. Like something from a the mind of a particularly sadistic novelist Adolf Hitler went beyond the boundaries of anything seen before and attempted to take over the world, presumably laughing maniacally as he went along. Even someone with a pragmatic point of view like myself could see how the ordinary man in the street was stirred into action by Hitler's deeds but you only have to look at the nascent opposition to the draft system to see that the tide was turning and no longer was dying for your country an honourable feat. By the time the US chose to intervene in the Vietnamese quarrel society as a whole had begun to question the motives of those that sent innocent young men to die. Not only were those at home in opposition to the war but those that fought did so under duress thanks to a draft which enlisted men to fight whether they liked it or not. One GI famously summed up the mood of US troops when saying 'We are the unwilling, led by the unqualified, doing the unnecessary for the ungrateful'. Suddenly it was not simply a matter of the good ol' boys helping the poor underprivileged yellow men from themselves. People were becoming socially conscious thanks to the power of television as images like these helpless children running from the aftermath of an American aerial assault were beamed into the living rooms of horrified audiences. Finally it seemed that the world as a whole had come to the realisation that a call to arms need not be the only solution to conflict and that there were other means of resolving disputes. But arguably more importantly everyone was beginning to understand that in truth we weren't all that different, the Vietnamese father of two who set off early to work each morning shared similar travails to the labourer from Queens who after a hard twelve hour shift at the factory liked nothing more than to relax in his easy chair with a can of Bud lite. If the opposition to the Vietnam war and the subsequent withdrawal of troops is considered a watershed for humanity then what on earth must those who lobbied and marched for peace think of society's outlook on war today. Despite being more educated than ever and countless cultural advances it could be argued that ignorance and hate are more prevalent than ever. Worryingly it appears that most of those that spew incoherent bile are the educated ones and they have used their learnings to promote fascist beliefs to all who will listen. Of course much of this could be down to our collective fascination which all things warfare related. Ask any man from the age of sixteen to sixty to name his top ten films and chances are you will find one of many war epics in there somewhere. Even though the majority of books, films, drama series etc make no attempt to glamourise the events depicted we are still unerringly drawn to them as we see men just like us endure experiences beyond our belief. This morbid curiosity seems to stem from a desire to feel their pain, to almost get in the trenches with them and savour the full force of a shellacking whilst under heavy fire all from the comfort of our armchairs, vicarious living at it's best. Of course there's absolutely nothing wrong with a bit of escapism from time to time and those involved in works like Platoon, Band of Brothers and Chickenhawk should be commended for their unflinching portrayal of events. Has this consistent exposure to the horrors of war somehow blurred the lines of reality. Films, and to a certain extent video games, are so authentic nowadays that it's almost impossible to discern what's real and what's not. The debate as to whether violence on television and other forms of media pollutes the minds of our youth is a discussion for another day but what can't be disputed is that the impact of real life events has been lessened by the entertainment industry. Occasionally we will see destitute families fleeing their homelands and feel true sympathy for them but for the most part the events unfolding on our screens take on an almost otherworldly feel. Even something as dramatic as the attack on the Twin Towers in 2001 became nothing more than a television event as we all frantically texted our friends to ensure they were watching the drama as it happened. Only later on when we watched documentaries such as The Falling Man did we begin to truly appreciate what those people went through. As members of the 'free world' we were almost willed to feel outraged by the events of 9/11, almost immediately there were reports of revenge attacks on innocent Muslims in the United States as incensed locals lashed out at what they believed to be viable targets. If the same thing happened to Americans every time their country decimated another nation there would be a countless stream of confused and bruised yanks nursing their wounds and wondering 'what the hell did I do?'. So like the song asks what it is good for? Justice for those who died on that balmy September morning was finally gained but at what cost? 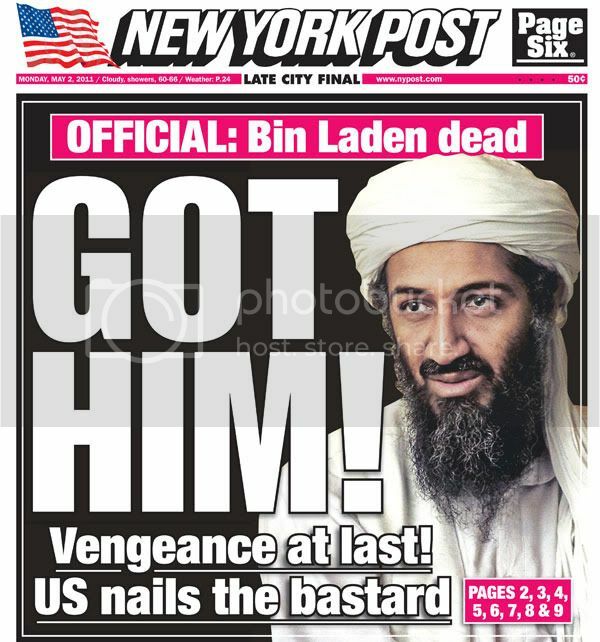 If given the choice would those who perished in New York have chosen for thousands more lives on both sides to be sacrificed just so Bin Laden could get what he deserved? Sure the US was a nation in outcry and almost to a man it's inhabitants sought revenge for what happened to their citizens. But why must every single action result in a retaliatory reaction? It's a never ending cycle of death and misery which will continue unabated unless the powers that be can have the common sense to put an end to it. Like a gaggle of boozed up lads at chucking out time they lock horns with little or no thought to the consequences when all it would take is for one to simply walk away and say 'no more'. Maybe the fear of being labelled a coward or a weak leader causes those who govern us simple souls to act in this manner, the more cynical would say that self preservation or financial gain is the real reason. Whatever it is that motivates those in charge to make these decisions it's highly unlikely that they consider the ripple effect of their actions. As they sign their papers and commission their generals those who will ultimately pay the full price go about their day oblivious to the horrors that await them. It makes you wonder if we won't be fully content until we have completely destroyed not only each other but also the world we inhabit. Absolutely nothing indeed.